Posted March 25, 2016, in News. 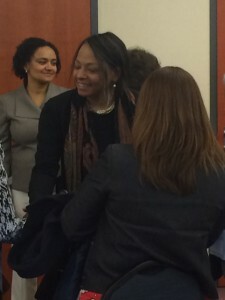 On February 25th, 2016, the Senator Walter Rand Institute for Public Affairs in tandem with Burlington County community officials and leaders held an official launch of the Burlington County Juvenile Delinquency Prevention Effort. 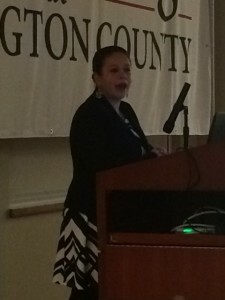 The event was held at the Enterprise Center of Rowan College at Burlington County’s Mt. Laurel Campus and included statements from President Paul Drayton of Rowan College at Burlington County, Burlington County Freeholder Deputy Director Kate Gibbs, Raymond Milavsky of the Burlington County Prosecutor’s Office, the Honorable John Call L., P.J.F.P., of the Superior Court of New Jersey, and Wanda Moore of the New Jersey Office of the Attorney General. WRI’s own Tracy Swan (Senior Project Administrator) delivered the presentation on the project’s efforts, and Karen Rosado (Project Coordinator) discussed next steps going forward. The Burlington County Juvenile Delinquency Prevention Effort is unique as the first project of its kind in the state of New Jersey to begin its work within three South Jersey municipalities, each of which was introduced by its respective mayors: Suzanne Woodward, Council President, representing Barry Conaway of Burlington City, David Patriarca of Pemberton Township, and Nathaniel Anderson of Willingboro. The effort includes a coalition of stakeholders in each municipality to analyze and identify trends that can be addressed to reduce and prevent juvenile crime. Further, it will review the risk and protective factors in their municipalities leading to or protecting against juvenile delinquency, discussing issues and potential solutions with experts, practitioners, and even users of the various systems that juveniles come into contact with. 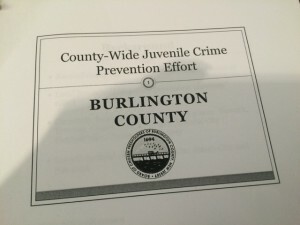 Based on the vast amount of data and information analyzed, along with identification of strengths and weaknesses existing in each municipality, the Burlington County Prevention Policy Board will develop and implement a plan to reduce and ultimately prevent youth from getting into trouble and involved in the criminal justice system. WRI will help collect, analyze, map and present census and crime data for Board Members; as well as research and present evidenced-based/best practices from across the country. WRI will staff the effort through this entire process and help them implement solutions, track results, and evaluate outcomes. Page last updated by Senator Walter Rand Institute for Public Affairs at 1:06 pm March 25, 2016 . This page was printed from http://rand.camden.rutgers.edu/2016/03/25/wri-launches-burlington-county-juvenile-delinquency-prevention-effort/ at 4:16 PM Monday, April 22, 2019.